Here’s the deal, because there are two major periods for the band Heart is one of those bands with a dividing fan-base. Therefore depending on which period of the band you prefer you will either like this album or you will not like this album. With 2004’s “Jupiter’s Darling” album the Wilson sisters made a conscious decision to go back to their 70’s acoustic driven Zeppelin influenced rock. While I thought “Jupiter’s Darling” was a mixed bag, I am happy to say that Ann and Nancy were much more successful with “Red Velvet Car” and that is for the most part due to the fact that the songs are just better. 1. There You Go– The opening track , a mellow acoustic track. A good song but not one that I would use to open up the album with. 2. WTF– the second track and would have been a much better song to open up the album with, a hard rocker with a 70’s rock vibe. 4. Wheels– My personal favorite from the album a great rocker and Ann sings the hell out of it. She sounds like she’s 20 years old again. 5. Safronia’s Mark– A mid tempo acoustic Zeppelin influenced rocker. 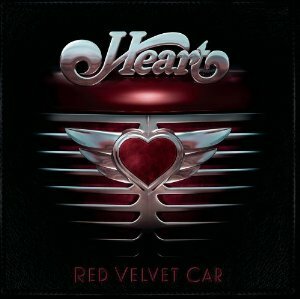 All in the all “Red Velvet Car” is a good album and Ann’s voice is just as amazing as it was 30 years ago. The only problem I have with the album is that it is a bit mellow. I would have liked a couple more rockers, but it definitely has direction.